In case you don't get it, see previous posts on buybacks here and here, that explain how buybacks do not affect share prices, and certainly cannot cause the rise since 2008. Thanks to a correspondent for the pointer. One intriguing aspect of the "buybacks are propping up stock prices!" news boom: it offers a perfect example of how media citation chains generate false narratives. There are economists who think buybacks are bad. But their arguments are rooted in agency concerns, inequality, etc. 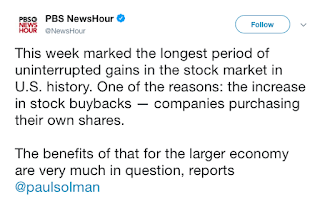 None of these economists, to my knowledge, has actually made the claim that buybacks can increase share price over the long-term. But what happens when Vox misinterprets a Harvard Business Review article by William Lazonick (deriding buybacks on the standard lines, but never once claiming they can increase stock prices over the long-term)? Well, a bunch more articles pop up repeating the "buy-backs drive up stock prices forever!" error, CITING THE VOX ARTICLE as their source. Then each of those articles gets cited in turn by more outlets, creating a false narrative. Eventually the growth becomes sufficient for even stolid old PBS to report it: if enough people repeat something, it becomes "true" for all practical purposes. I was thinking about Modigliani-Miller with respect to your equity-financed bank idea, but I suppose it's a more general MM question. Case 1 is all-equity financed, Case 2 is a traditional capital structure, Case 3 corresponds to the equity-financed bank. Basic MM would suggest that the value of the firm should be the same in each case. But what happens when there are taxes? Particularly, is the value of the firm the same in cases 2 and 3. The standard tax MM argument for case 2 is that there is a tax shield, meaning that the debt-holders don't have to pay taxes but the equity-holders do. In Case 3, there are two levels to the capital structure. In the first level, the value of equity between the two pieces should not be equal because one is financed partially with debt (it has tax shield benefit). However, the value of the equity in the fully equity-financed should equal the value in Case 2, adjusted for tax rate. Maybe the reason why it gets complicated in my head is that the standard way MM is discussed with taxes doesn't consider the implied value of taxes. It's as if the government is also an owner in the firm. Increasing debt/equity does not change the before tax firm value, rather it increases the after-tax firm value by reducing the government's implied ownership stake. That seems way more intuitive to me. I'm not sure if this helps, but the way I think of it at a 10,000 foot level: if your internal discount rate differs from the interest rate on your debt, then borrowing at the company level either creates (or destroys!) post-tax value. * If your internal discount rate is identical to the interest rate on the debt then, once you run through the math, the post tax value will be identical regardless of how much is borrowed. That is of course from the perspective of a single firm... perhaps at a macro level the assumption is that interest rate and discount rate end up being identical, so the matter can be ignored? *This might no longer be true following tax reform, which severely curtailed the ability to deduct interest expense. I'm puzzled by your comment that buybacks don't affect share prices. MM says shareholder wealth is unchanged but the buyback will certainly increase share prices, right? From the basic theory, share prices shouldn't be affected. As an example, consider a company that has $10 in cash and $90 in other assets on its balance sheet and is fully equity financed (so, $100 in equity). If there are 100 shares outstanding (worth $1 each), and the company spends its cash to buy back 10 shares, the end result would be a company with assets worth $90 distributed over 90 shares, so the share price is still $1 each. Of course, this is very basic and ignores stuff like agency costs and asymmetric information. There’s a difference between value per share and total market value of equity. It’s not so much that the anti buy-back crowd doesn’t understand MM, it’s just that they don’t care. 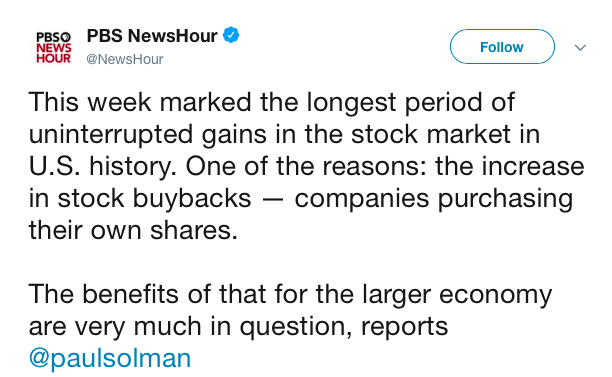 Consider, for example, today’s op-ed in NYTimes (“End Stock Buybacks, Save the Economy” by William Lazonick and Ken Jacobson). What needs defending is not MM. What needs defending is the idea that shareholders are the rightful owners of the equity value in the company and the rightful owners of the control rights. This is not meant as a criticism of John for explaining MM in the WSJ. It’s more of a criticism of those of us who teach in business schools. Even the half-bright MBA’s understand MM, but lots of people are telling them that corporations have broader responsibilities to stakeholders and society (without, of course, defining who those groups really are and what ethical system gives them claims on the corporation). We need to at least offer plausible reasons why the maximization of shareholder value is an honorable objective. In other words, I miss Milton Friedman. I just read the article and it makes no sense. Boards don't work in the interest of shareholders because of dogma, but because shareholders have paid a price for it. Any person with $216 can get Tim Cook to work for him. Also, it constantly talks about "market manipulation", without clarifying what they mean by it. My understanding of market manipulation is when a company lies or deceives in some way investors. Announcing a buyback and then carrying it forward is not market manipulation, just like introducing a new iphone, selling billions of dollars and making the stock go up is not market manipulation. Also, the authors seem particularly annoyed at buybacks but not at dividends. But buybacks are like big dividends concentrated in a few shareholders. Stocks usually go up when a buyback is announced just like they usually go up when a special dividend is announced. "Defenders of buybacks contend that they do no harm because the funds are reallocated through financial markets and used elsewhere in the economy. A company’s profits are, however, the financial foundation for investments in productive capabilities, first and foremost in employees. Investment in training and retaining employees is the key to productivity growth and innovation, for individual companies and for the economy" According to the authors, when a shareholder sells a share to the company in a buyback, the money he receives magically disappears. Couldn't it happen maybe that the seller uses the money he got from a buyback to buy another share from another company, or an IPO, or open a pizza restaurant, or making a loan? This is all correct (and well done, for that matter), but I think there's a huge disconnect between Lazonick and those who are citing his work. While Lazonick seems to understand MM and have unrelated problems with buybacks (inequality, execs getting too rich, global warming, etc. ), most "news" sources citing him seem to incorrectly think he is saying buybacks permanently increase share price via "manipulation." "incorrectly think he is saying buybacks permanently increase share price via "manipulation."" Market manipulation can never be permanent for if it were it wouldn't be manipulation. Market manipulation is when a company lies or misleads investors leading to asymmetric information, some people buy the stock with incorrect information and those who know the truth sell the stock and get away with the money. Market manipulation is fraud and is a crime, but share buybacks are not market manipulation, certainly not if they are announced before hand. Reasonable people can disagree on a lot of things, but not on whether share buybacks are market manipulation: Share buybacks, when disclosed beforehand (and this is typically the case), are not market manipulation. "Market manipulation can never be permanent for if it were it wouldn't be manipulation." Well yes, of course, that's why the whole thing is so foolish. And yet one can read articles in many "legitimate" sources that make precisely this claim, citing Lazonick. Sad stuff. Lazonick himself is a little better at least... if I understand correctly, his claim is that buybacks are used to temporarily manipulate stock prices in a manner that unfairly benefits executives and insiders (since SEC rules impose restrictions on when these folks can buy/sell, they can benefit greatly from short-term manipulation). That claim strikes me as dubious, but at least it's not incorrect on its face. One would need to actually do some homework to prove it's wrong and, let's face it, what qualified person is going to bother (given that such research will become irrelevant very quickly once the present buyback news cycle runs its course)? Buybacks decrease the market capitalization of a company because cash is transferred out of the company to the shareholders, who are just as well off as they were before (since dividend/buyback policy cannot create or destroy wealth). The public is as well off despite the lower market cap because now they have the cash. So buybacks do not have to (and cannot) raise the share price to be value-neutral. Do I get an "A"? Something else affects stock prices, buybacks are a symptom. Who will pay unfunded state pensions?